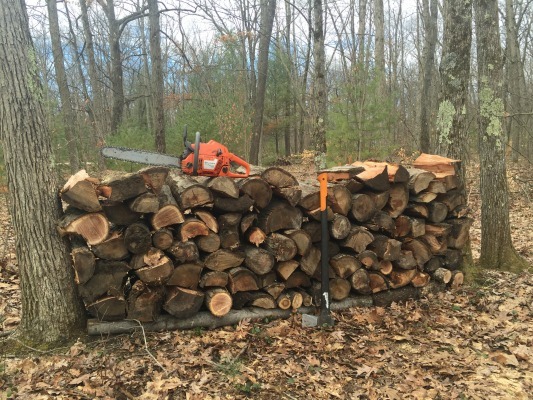 Stacking Firewood Between Trees - Should You Do It? Stacking firewood between trees may sound like an easy, convenient way to store your firewood but is it really the best way? Just about everyone has considered it at one time or another, especially if you live in a wooded area. The biggest appeal is that the trees provide sturdy ends to stack your firewood against. Why buy metal T posts for end supports or spend time building a firewood rack when you can just use a couple of trees in your backyard? 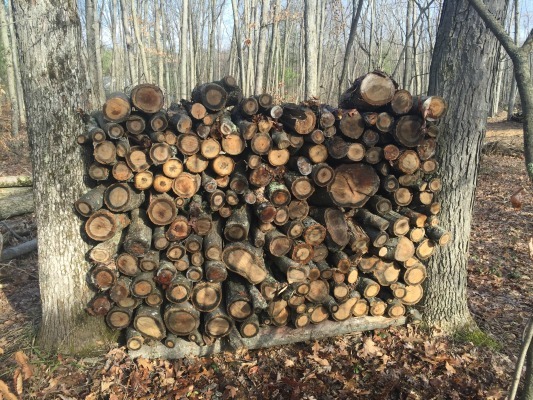 Using a tree for a support can work for stacking firewood, however, stacking wood against a tree can cause damage to the tree and even potentially kill the tree. Before you rush out and stack a perfect pile of wood between two healthy trees, lets look at some of the benefits and downfalls to stacking your wood between trees. The main reason most people stack their firewood between trees is simply for convenience. It doesn't allow the wood to dry any faster and it usually causes the wood to dry slower since it's shaded by the tree and not exposed to direct sunlight. However, if you don't like to make "bookends" with split firewood or you don't want to spend $4 on a metal T post, a tree seems like a logical solution. The most common problem you'll face is your firewood stack falling over. It's happened to me and unless you're really lucky, it will probably eventually happen to you. As the trees move and sway in the wind and your firewood dries and shrinks, eventually you'll walk out one day and find your firewood stack laying on ground. Stacking between larger, stronger trees such as mature oaks or maple will help prevent the pile from falling over. Also, don't stack the wood higher than 4 feet tall. Any higher will cause the pile to become unstable and "tippy." Second, as you stack the wood against the tree, and as the trees grow and shift, you risk damaging the trees bark and potentially killing the tree. The stacked firewood can cause the bark to rot and the weight of the wood can cause soil compaction around the base of the tree, all things that can cause a tree to become sick. In order to properly stack firewood between trees you should do 2 things. First, make sure you place a runner under the firewood to raise the wood off the ground. Don't just stack the wood directly on the ground because the wood will soak up ground moisture and never season. I like to cut a couple of long limbs and run two limbs parallel to each other between the two support trees. This way the wood is elevated off the ground which allows air to reach all sides of the firewood, plus I don't have to purchase any extra supplies because the limbs are free. After the wood is stacked, remember to cover the top of the stack with a tarp or lay a couple of scrap pieces of plywood on the top. If you use a tarp or other similar plastic, don't cover the entire stack because it will just trap the moisture and cause the firewood to become moldy. Simply cover the top section and secure it with a couple of bungie cords so it doesn't blow away. You just want to shed the raid off the stack but still allow the firewood to breathe and expel moisture. Second, if you're stacking firewood between trees, don't let the stack sit there year after year. Use up the firewood the following year. This will prevent damage to the tree bark as the trees grow into your stack. Can you stack firewood between trees? Sure, as long as you're careful not to damage the bark and you don't let the wood sit between the trees for more than 1 year. Choose two trees that are large and mature so they don't move around a lot with the wind and make sure you place a runner under the wood to elevate it off the ground. Remember, it's always better to use a different end support other than a live tree, but if you're looking for a quick and convenient way to stack a little bit of firewood that you plan on using soon, a couple of trees will work just fine.